The following information is available from a patient, who had a keyhole and a conventional surgery performed by Mr. Adam Budgen. 24 hours following the operation I experienced only a dull ache in the left foot centred around the big toe joint. This pain was completely manageable with over-the-counter pain relief. 48 hours following surgery there was little or no pain at all. I was able to bear my entire weight on the left foot without any real discomfort. The toe joint was stiff and I did experience mild pain when trying to move the big toe. No more pain relief required for this foot. 6 days after surgery - you can see from the photos that there is only mild swelling in the toe joint area and the incisions are minimal and are healing nicely. 13 days after surgery - I am now able wriggle my big toe freely without any pain and I'm whizzing around in my plastic shoes!! 24 hours after surgery - I am experiencing pain centred around toe joint. Need to be on pain relief every 4 hours day and night. 6 days after surgery - the pain has moved to the top of the foot arch. 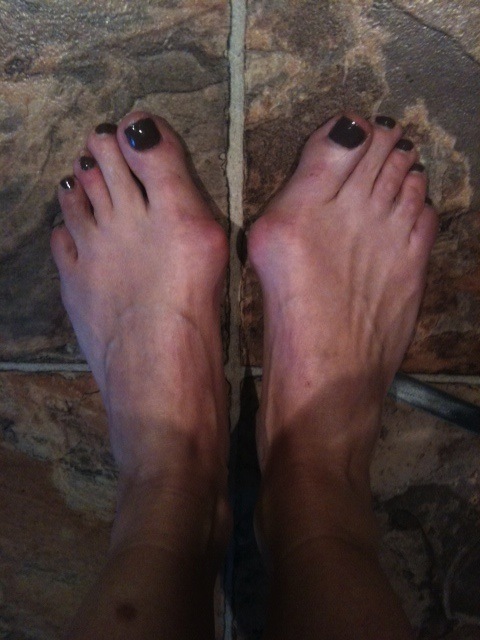 The foot feels very swollen and I am still unable to put my weight on my right foot. I am still on pain killers 24/7. 8 days after surgery - the pain is finally starting to subside but the foot still feels swollen and doesn't feel comfortable to put my weight on it. 9 days after surgery - first day without pain relief after surgery. Foot feels stiff in the morning. Foot still needs to be elevated most of the day. 11 days after surgery - I am finally able to wriggle my big toe without stiffness or pain and I can put my weight on my right foot. I can now sleep comfortably at night..